published by Hamish Hamilton, is available from all good bookstores in the real world and online. For another interview with James Robertson and notes on The Testament of Gideon Mack for reading groups visit The VP Book Club. THE RECENT CONTROVERSY occasioned by the publication of that peculiar memoir The Testament of Gideon Mack by Dr James Robertson has resulted in a renewed interest in this website. Scotgeog.com was originally conceived as a digital gazetteer of Scotland, but this plan has been abandoned and the site has now been redesigned to concentrate entirely on the affair of the Reverend Gideon Mack. THE LAST MONTHS - as most people presume them to have been - of Gideon Mack's life were so peculiar, and aroused such debate, that a considerable demand grew among the public for further information beyond that contained in The Testament of Gideon Mack. As a result, this website has been given over to an archive of miscellaneous papers, writings and thoughts concerning Mr Mack, and to the opinions of Dr Robertson in relation to the memoir and its supposed authenticity. DISCLAIMER: This website sets out neither to argue in favour of nor to discredit the contents of the book The Testament of Gideon Mack. It aims only to present material relating to this book and to the wider question of the life of the Reverend Gideon Mack, as submitted by readers and other interested parties. New material will be added as and when appropriate. The publication of such material on this website in no way indicates that we approve, condone or endorse the views and opinions expressed therein. 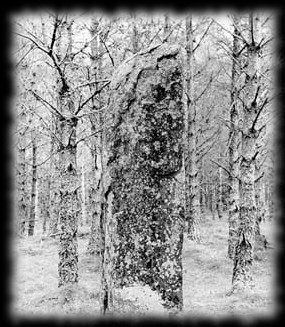 Could this be an image of the standing stone Gideon Mack claimed to have discovered in Keldo Woods? This photograph is said to have been found in the manse at Monimaskit by Mack’s successor. It appears to show a stone among trees, and scribbled on the back of the photograph are the words, in an unknown hand, "Keldo Woods Feb 2003". As can be ascertained by referring to the relevant Ordnance Survey map or to Craigie, The Ancient Stones of Monimaskit and Surrounding District (Ballindean Press 1983), no such stone exists in Keldo Woods.